These elegantly serpentined French 'cabriolet' chairs relate to those at Erddig, Wrexham, which were commissioned in 1770 by Elizabeth Cust from the court cabinet-maker, John Cobb (d.1788) (A. L. Cust, Chronicles of Erthig on the Dyke, London, 1914, pp. 118, 119 and 125 and J. Cragg, 'The re-arrangement of room furnishings at Erddig', Apollo, April 2002, p. 38, fig. 4). 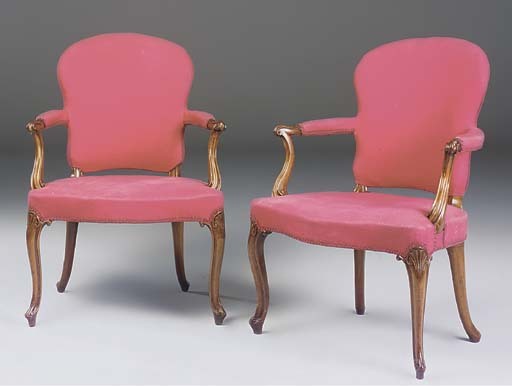 This pair of armchairs would appear to have formed part of the same suite as a set of six offered at Christie's, London, 6 July 1950, lot 136.